Q: According to media reports, on the sidelines of the Boao Forum for Asia Annual Conference 2019, China and Luxembourg signed an MOU on the Belt and Road Initiative cooperation. Prime Minister Xavier Bettel of Luxembourg said in a statement that the signing of this accord is a new step in developing China-Luxembourg relations and in bilateral cooperation at the economic, commercial, academic and cultural level. I wonder what is your comment on that? We also noticed that during President Xi's visit to Italy, the two sides signed a document on BRI cooperation, too. Can we say BRI cooperation is flourishing? Does it mean China-Europe cooperation is deepening with more substance? A: China and Luxembourg share sound and stable bilateral relations. The signing of the MOU by the two countries on BRI cooperation marks a new phase for our friendly cooperation. China will work with Luxembourg for deeper practical cooperation in various fields, greater connectivity and fresh progress under the BRI framework to deliver more benefits to the two peoples. During the recent successful European visit, President Xi and the European leaders reached important consensus and achieved fruitful outcomes during their constructive discussions on BRI cooperation. A MOU was signed by China and Italy. Monaco expressed readiness to participate in BRI cooperation. China and France signed agreements on the third round of BRI-related demonstration projects in third markets and launched a third market fund. German and EU leaders also expressed readiness to find more complementarities and foster innovative cooperation between the EU's Euro-Asian connectivity strategy and the BRI. The BRI has seen warm reception and active participation since it was first proposed. It is now joined by more than 150 countries and international organizations including over 20 European countries. Europe's recent remarks and measures show that an increasing number of European countries have realized the significance of the BRI and the major opportunities it brings. The second Belt and Road Forum for International Cooperation will be held next month in Beijing with orderly preparations underway. During the second BRF, we look forward to taking stock of cooperation experience and drawing up a blueprint for the future, to embrace more substantive, results-oriented BRI cooperation, inject greater impetus into global growth and open broader vistas for world economic ties. Q: Can you tell us how many leaders are coming to the Belt and Road summit? Is that more than the last summit? Which leaders are coming? I'm aware that some countries have already announced it, such as Russia, Pakistan and the Philippines. Also there continues to be a lot of concern in Western countries about the Belt and Road projects, specifically in the United States, the Acting US Ambassador to the UN just two weeks ago, during a debate about Afghanistan basically, called the Belt and Road corrupt. How do you respond to those criticisms from the United States? A: Like I just said, the 2nd Belt and Road Forum for International Cooperation will be held in Beijing in late April. It is the most important diplomatic event China will host this year and is bound to be another gathering catching international attention. At present, preparation is moving forward in an orderly fashion. We hope and believe that the 2nd BRF will be a full success, setting another milestone in the BRI cooperation. As to how many leaders will attend, we will release relevant information in due course. 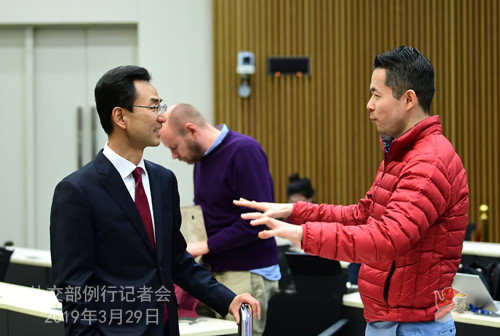 You mentioned the accusations and criticism made by the US representative at the UN Security Council during the voting on a certain resolution, I want to say that Deputy Permanent Representative Ambassador Wu Haitao already rebutted these false and groundless accusations in his explanatory remarks after the voting. You can find his remarks on the website of the Chinese Permanent Mission to the UN. As a response to the US slandering and blame regarding the BRI, I just want to cite one sentence from what I said yesterday. The US should not overestimate the effectiveness of their rumor-mongering or underestimate other people's ability to make informed judgments. Q: Two follow-ups on the Belt and Road. I know Ambassador Cui Tiankai, in his new year's address said that the US was welcome to attend the nest Belt and Road summit. Have you issued a formal invite to the US to attend? Have the Americans told you who will attend? Second question is about Kuwait. The Kuwaiti government is spending a lot of money on a new project, they called the Silk City project. As a lot of Chinese investment going into that, does China consider this Silk City project part of the Belt and Road? More broadly, how does China consider the role of the Middle East, specifically the Gulf region in China's Belt and Road? Why is China investing so much money into Kuwait and some other projects in the Gulf region? A: That's quite a few questions. Let me try to take them one by one. First, on the US. In fact, China and the US have been in communication with each other on the BRI despite the US side's misunderstanding, criticism and slandering against the initiative. As for the US participation in the 2nd BRF, the answer will reveal itself in due course. As for Kuwait's Silk City project, I want to say that Kuwait is an important cooperation partner for China in the Gulf region on the BRI cooperation. China would like to strengthen communication and practical cooperation with Kuwait on projects including the development of the Silk City and the five Kuwaiti islands to deliver more benefits to the two countries and two peoples. You wondered why China made such a big investment. I believe that it is business cooperation. It is consensual and mutually beneficial. Q: I've got a short one. This has been repeatedly brought up in recent days. China is accused of shielding terrorists for putting on hold the request to blacklist Masood in the UN Security Council 1267 Committee. I wonder what is your response? A: Putting a technical hold is consistent with the 1267 Committee rules. It is not China that has put more technical holds than any other country in recent years in the committee. If China is accused of shielding terrorists, all countries having put technical holds must receive the same sentence. Following that logic, won't the country that has put more technical holds than any other country be called the top protector of terrorism? 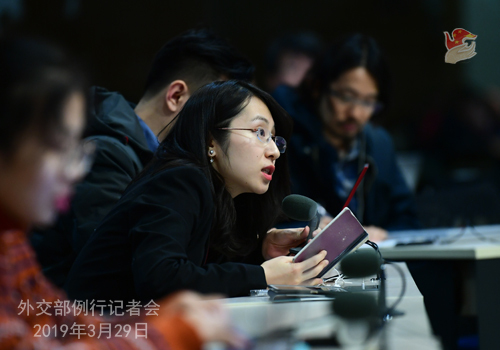 China has put a technical hold on the relevant request in the 1267 Committee not long ago to get more time for a comprehensive and thorough review and to allow time and space for dialogue and consultation between relevant parties. China has been in close contact with the parties concerned for a proper solution through dialogue. We hope all Security Council members can work together to this end. Q: A follow-up on the 1267 Committee. When China put a technical hold in February, it had actually sought time to explain the rationale behind this move. Have you prepared your response regarding the rationale for your putting a technical hold on the proposal? A: China has been in close contact with the relevant parties. Like we said, we will continue to play a responsible and constructive role in the 1267 Committee discussions. We also hope all relevant parties can work together for a proper solution. 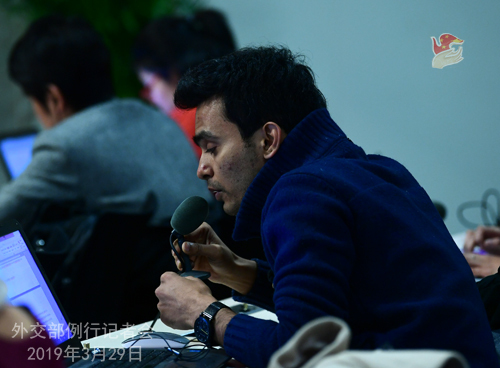 Q: One very important aspect in all the four technical holds China put up on this particular issue is about providing evidence and the discussions between the two parties. Now whatever evidence India has provided like in the previous cases, Pakistan always came back to say that it is not enough. Don't you think it is also incumbent on the particular country which is facing the allegations to also probe and and provide evidence and those countries which are supporting the particular country to also take interest in that? A: The 1267 Committee has clear criteria for the listing procedures. What China did conforms with Security Council resolutions and the 1267 Committee's rules of procedure. As we have continuously emphasized, we will continue to play a responsible, constructive role and maintain communication with the relevant parties for a proper solution. Q: As we know, the Japanese government's plan for 5G spectrum allocation will be released in the near future, and operators in the country will have to decide whether to cooperate with Chinese companies like Huawei and ZTE. Could you comment on this? A: After the Japanese government revised its procurement rules, Beijing has repeatedly expressed concerns. Yesterday the spokesperson of China's Ministry of Commerce reiterated our position. China upholds free trade, follows international rules and opposes political intervention in normal business behaviors. We will closely follow the result of Japan's 5G spectrum allocation. We hope the Japanese government can honor its commitment to free trade and foster a fair, transparent and predictable business environment for Chinese companies to carry out mutually beneficial cooperation. Q: If Japan does exclude Huawei and ZTE from its 5G networks, will that threaten the ministerial visit that is currently scheduled for mid-April in Beijing? A: We don't answer hypothetical questions. I believe the Japanese side knows China's position very well. Q: Yesterday, at the opening ceremony of the Boao Forum for Asia Annual Conference 2019, Premier Li Keqiang announced some measures China will take to expand its opening-up. How will these measures affect the region and the world? A: Premier Li Keqiang delivered a keynote speech at yesterday's opening ceremony of the Boao Forum for Asia Annual Conference 2019, announcing a series of important measures to expand China's openness, including formulating supporting regulations for the Foreign Investment Law, further easing market access, strengthening protection for the legitimate rights and interests of foreign companies, and continuously expanding the opening-up of the financial sector, and maintaining the continuity and stability of investment policies towards Hong Kong, Macao and Taiwan. These measures have been closely followed and widely praised by the international community. Premier Li Keqiang's speech once again proves that China is taking concrete actions to meet its commitments to further opening up, to promote mutually beneficial cooperation with the rest of the world, and to uphold free trade and the multilateral trading regime. You may remember that in 2017, President Xi Jinping championed free trade and multilateralism in his keynote speech at the annual meeting of the World Economic Forum. At the opening ceremony of the Boao Forum for Asia Annual Conference 2018, President Xi Jinping announced in his keynote speech a series of important measures to promote opening-up, including easing foreign equity restrictions, strengthening IPR protection, and taking the initiative to expand imports. The recent 13th National People's Congress adopted the Foreign Investment Law which establishes the system of pre-establishment national treatment plus negative list to foreign investment and further improves the business environment for foreign companies in China. Looking back over the past few years, China has continuously introduced new policies and new measures to expand opening-up. The efforts and progress speak for themselves. We have been stressing that China's door will not be closed and will only open wider. 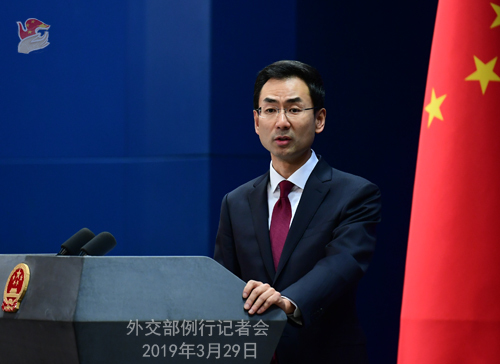 We will continue to drive the comprehensive deepening of reform with high-level opening-up, creating more space and opportunities and offering more "Chinese dividends" for the development of other countries and the global economic growth. Q: At yesterday's US State Department press briefing, Sam Brownback, ambassador-at-large for international religious freedom, when talking about Xinjiang, said that "it's not just the camps anymore and people are limited on their movement in and out of the villages in that region". Do you have any comment? A: China strongly rejects the remarks by the US ambassador-at-large for international religious freedom. Xinjiang currently enjoys social stability, good momentum for economic and social growth and harmony among all ethnic groups. Residents there now have a much stronger sense of security and fulfillment. China is firmly opposed to US interference in China's domestic affairs using Xinjiang as a pretext. Q: My media organizations have interviewed Uygurs in Turkey claiming they have been tortured in " re-education camps" in Xinjiang. What is your response to these allegations? Second, when will international journalists and observers be allowed to visit these camps in Xinjiang that you say are training facilities? A: You haven't been around lately, have you? I have answered many similar questions. I do wonder why some journalists choose to believe the made-up stories of a handful of individuals overseas. Are you so sure they are telling the truth? Why on earth would you believe certain individuals' fake stories over the official statements of a responsible government? Truly, your judgment is beyond me. As to visits to vocational education and training centers in Xinjiang, any follower of latest news or our press conferences will have noted that China has organized many such trips for foreign diplomats in China, foreign media and other foreign delegations. After seeing for themselves Xinjiang's social stability and people's sense of fulfillment, many of them commended China's Xinjiang policies. You may look for the wide news coverage of that online. Q: The Kazakh Foreign Ministry said that yesterday its foreign minster and Wang Yi discussed the issue of the situation of ethnic Kazakhs living in China. I wonder if you could share more details about what they discussed? A:Yesterday State Councilor and Foreign Minister Wang Yi held talks with Foreign Minister Beibut Bakirovich Atamkulov of Kazakhstan. There is a press release on that. After the talks, they jointly met the press. State Councilor stated clearly at the press conference that the lawful de-radicalization measures taken by China's Xinjiang Uygur Autonomous Region effectively safeguarded local security and stability, contributing significantly to peace and stability in our region and providing good practice to the international community's efforts to fight terrorism and eliminate extremism. We appreciate the Kazakh government's understanding and support for China's position. We will never allow anyone or any force to undermine the friendship and mutual trust between China and Kazakhstan. State Councilor Wang's statement, I believe, has answered your question. Q: There are all these reports of the trade talks dragging out and comments that it will take weeks, months for an agreement to come together. I hope you can give more details on this. A: Yesterday the Commerce Ministry spokesperson has already responded to relevant questions. I have nothing further to add.